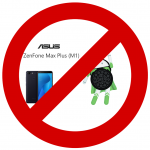 It has been a month since Asus has released firmware to Asus ZenFone Max Plus that included Android Oreo. I was lucky to be stranded on a tropical island with no connection so I couldn’t install it because it turn out the new firmware is a disaster. The numbers od users comlpaining in the forum spiked and they were quoting many different problems with the build. You can read about some in my post of Oreo update and in my warning not to update the phone, but the list is not complete. New errors and bugs are constantly being found and many users had to buy a new phone because the update has made the phone useless. I’m not exaggerating here: if your phone can’t connect to 2G, 3G or 4G, is it still a phone? If it gets so hot you can’t hold it, is it still usable? If the battery dies in a few hours, is it still a mobile phone? By all definitions, it’s not a usable mobile phone. And if people rely on them for business, well, it’s cheaper to get a new phone than lose customers with the sad excuse for the “Battery king”. Replies from the forum moderators are pathetic at least, urging people to factory reset the phone, clear data in apps, change a SIM card or some other “turn it off and on again” help that usually call centers are trained to suggest. I have even noticed that besides helpful Emilee, a regular Asus moderator on the forum, and the unbelievably rude Bill, a new moderator is replying to messages. Selena so far managed to only copy and paste standard replies, but it might be an indication that they need more staff for handing bad press. The most useful replies are the ones where they acknowledge the problem and write that they had let the developers know about it. Is the new build WW-15.02.1810.380 any better? After this month of being stuck on the Oreo build a new build arrived on December 18, firmware build 15.02.1810.380. If you were unlucky to get Oreo in the first place, there was nothing to lose by upgrading. If you stayed on Android 7, don’t get your hopes up that you should have Oreo. Users who had bricked phones by the update to Oreo from November jumped at the 15.02.1810.380 to see if the notified developers fixed any of the many things reported. They installed the update and realized with tears in their eyes that the bugs are mostly all still present. The phone still drops connection, it still gets hot, apps still crash and battery time is still poor. 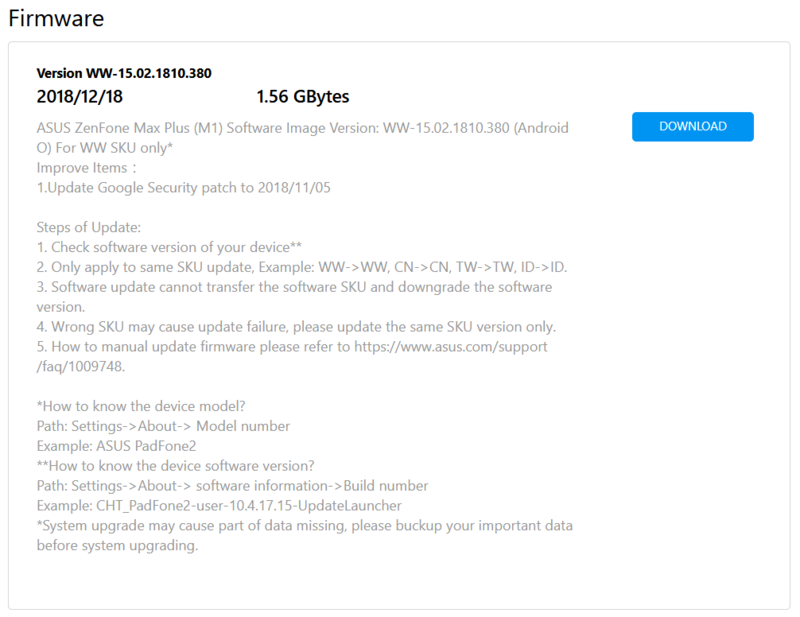 Which probably means that the release notes were probably correct – none of the huge issues with Asus Zenfone Max Plus (M1) were fixed in December. Should I upgrade to 15.02.1810.380? If you are still on Adroid 7, don’t upgrade! If you already upgraded to Android Oreo 8.1, then go ahead and upgrade. Bugs won’t get fixed, but you might get security updates if that’s worth. I am still on Android 7 so I haven’t updated yet. I have actually no plan of updating until the errors are fixed, and I guess that by that time I will own a new phone already. Has Asus abandoned Zenfone Max Plus? I think the answer to this question is NO. Asus has not abandoned ZenFone Max Plus. The new build has number 15.02.1810.380, the previous build was 15.02.1810.347. Note the last number that jumped from 347 to 380. In theory that means that they have built 33 builds before releasing it. That means one build a day if not more, and that indicates of active development. Sure, it might still be just security updates this time, but at least it looks like they’re aware of the bugs and are trying. It doesn’t mean that the M1 will get any better, but there is at least one person at Asus who has this goal. We’ll see if they succeed. When is the next firmware update for ZenFone Max Plus? The next firmware update for ZenFone Max Plus should be released sometime at the end of January 2019. 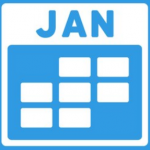 If they continue building at this pace, the version number should be around 15.02.1810.410+. I have Zenfone Max Plus (M1) ZB570TL 3GB RAM WW version and updated it to 8.1 Oreo with 15.02.1810.347 OTA update in November 2018. I can use it without any remarkable trouble just after update. And now I am using it with latest *.380 firmware and still keep no trouble every day. However, judging from ASUS’s forum, many ZB570TL users seems to have serious trouble in *.347 update and some of them cannot resolve it in latest update regrettably. I recognize your Blog is rare and remarkable news source with technical point of view for this very minor smart phone. If available, please keep cool and do not synclonize the the mood (meaningless personal attack against moderaters) like in ASUS’ forum. If you wish to try the Oreo update before next (or other trouble resolvable) firmware. I can tell my circumstance and you can compare it to yours. thank you so much for your comment and for your compliments to my blog. I try hard to get accurate information in the scarce information that’s available from Asus on this phone. I have been getting all my info from first hand experience with this phone until the Oreo update in November. The posts afret November reflect what I can learn from users on the forum, moderators from the forum, official Asus build page, and friends like you who comment on my posts. I’m so glad to finally read a positive review about the Oreo upgrade from an actual user. You’re right, the forum spiked with negative news after Oreo update and it has turned ugly sometimes because of users’ frustration and no meaningful solutions. I sympathize with those users. I’m so happy that it appears it’s not so bad as it seems for every user though. It’s true enough, happy users usually don’t post – only the users with problems do. Can you share your experience with the new Oreo updates here? It would be great to hear the experience directly from an owner of this Zenfone Max Plus M1 that is satisfied. You will hep me and probably other owners as well. I have still not updated and I’m looking forward to read your reasons and get reassurance that the upgrade is safe. Can you tell us more about in which country you use the phone, how many SIM cards you use, do you use an SD card, how long your battery lasts, if you’re always connected to 4G / Wi-Fi / GPS / Bluetooth and lastly the most important – how does Oreo feel on this phone. Are there any new features, is the phone faster now, makes better photos, works better? Do you like using the phone? I would try Oreo myself and report all my experiences here, but since there’s no downgrade to Android 7.0 possible and if the reports from the forum are true for me too, then I end up with an compromised phone. I’m still traveling, so I decided against it until I return to Europe. Please share your experience, the readers and me will be extremely happy to read something good. Also, I encourage other owners of this phone: drop a line of your experience (or a complete review if you can) in the comments bellow. You will help the Zenfone Max Plus M1 community a lot by doing so! Thanks! Indeed, if it failed, I could just change my Zenfone to other for daily use temporarily until some some solution founded. My Zenfone (seems like all functioned in Oreo) Spec. is as follows. detail settings are basically default. For my actual use, I need to charge every other night. How I feel in Oreo in Zenfone Max Plus(M1)? Frankly says, only a few worth to update. I was very fascinated by this Zenfone’s sales copy “BATTERY KING” and bought it while traveling without examination. It have not still become “BATTERY KING” now. Although battery saving was one of the biggest theme in Oreo, after the *.347 Oreo update, I actually felt battery life became little bit shorter. And on *.380 firmware, I feel no change. About other new functions from original nougat 7.0 to Oreo 8.1, most of them seems good. Some notification functions, Gmail, facebook messenger and other chat app had some trouble. Notification became late or not functioned firstly. I revised each app’s notification setting and remove from optimized app list. I could not solve it then. But after app’s update, they work fine now. Do I like using this smartphone? So,so. :)) but I will use this till the battery will require more frequent charge. I hope above writing will be any help for other users. thank you so much for your report and your experience. I’m sure it will help other readers and it helps me too. I own the 4GB RAM/64GB model and I have to say I’m impressed by your reported battery life! My phone never comes even close to that. It’s reporting around 19 or 22 hours when it’s at 100%, but actual time is somewhere around 12 -15 hours, depending on the usage. I rarely finish the day without the need to charge the phone more. Yes, it’s that bad and it was the same from the beginning when I bought it in March 2018. I guess the first lot was much better than the rest? WAO!! 12 – 15 hours for actual use from the beginning?? Just now, in Android settings -> Battery, my Zenfone indicates 1d8h38m passed after full charge, It still indicates 54% rest and it will last 1D14h58m. I suppose this is the better result and optimistic estimate. From yesterday, I have used my Zenfone less than regular for this one and half days, one call for phone, several chat use, several time in read/writing in Gmail, off-line text news reading about one hour, and so on. Hmmm.. 3-4 times.. The gap is so major.. Maybe battery is actually different, or ASUS’s battery setting changed by lot to avoid battery bombing like Samsung. From another point of view, LCD is one of the biggest battery usage. First time I used this, I felt the screen is too bright. I set screen brightness setting (in Android Setteing -> Display) minimum, and brightness level auto-adjustment in 2nd line from top is ON. I can read screen without under the direct sunlight. This setting maybe deffer from yours. There is a lot of other things differ from yours. If you want to compare other settings and usage to mine, please touch here or in your post in furture. now you see why some users are so frustrated with this phone. Yes, 12-15 hours of battery. I also have AccuBattery and at the beginning it reported the Combined use of 18-19 hours, but now it’s down to 15 hours and 5 minutes. This is just the estimate, and it’s usually less. Also note that when the phone reaches 10%-13% it will get empty in a matter of minutes and shut down. If there is 7% left, I have to connect the charger in 10 seconds. If I don’t, the battery will go to 6%…5%…4%… and the phone will shut down in that time. Users on forums report similar times and similar battery behavior, so I guess I’m not the only one. I never have screen off, but even when I don’t use the phone for hours, battery will drain. My battery health is at 92% or 3797 mAh since the time I have first installed AccuBattery. It hasn’t changed or degraded after I have used the phone for almost a year. It would be interesting to see your stats, too. I think I might use my phone more than you do. I think I have more screen on time, more data used, I also use it for photos. But even if so, I don’t use it 2 or 3 times more that would justify the battery drop. My screen is also on auto brightness, so that shouldn0t be that different. Also note that I was in contact with Asus and running debug logger for them so they could discover and fix battery drainage, but nothing that I know of came out of that tests. I didn’t even get feedback if anyone looked at the results or not. because my phone can not find this update. he is still in 7.0.
if the phone can’t find the update over the air, it might mean that you’re in one of the markets where the operator still hasn’t approved the update to roll out to users. Where are you? You can always update firmware from the link you provided, just make sure that you use the correct build (WW is for global ROM). Check in your phone’s about page which one you are using. I’m also still on 7.0, even if I see the update over Tha air available. However, the reason I don’t update in same as yours – I’m afraid to have much more problems if I update. I think I’ll only try updating once I buy a new phone and this will be my secondary – if, of course, other users don’t report that the problems are fixed.